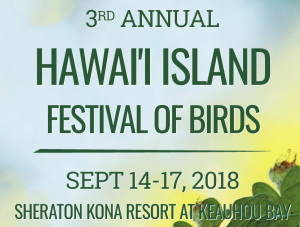 The Third Annual Hawai‘i Island Festival of Birds will take place Sept. 14 through 17, headquartered at Sheraton Kona Resort & Spa at Keauhou Bay. This year’s theme, “Back from the Brink: Hawai‘i’s Battle Against Extinction,” will showcase the herculean ongoing efforts to save Hawaii’s rarest bird species. 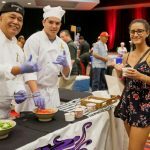 Among programming during the three-day festivals is the Birds, Brews & Binos street fair celebration beginning at 5 p.m. on Sheraton Kona’s oceanside lawn. The event includes food, handcrafted beers, premium wines, live music and silent and live auction items. An original artwork block print donated by Caren Loebel-Fried will be featured among donations during the live auction Saturday evening. The print will be also available for sale as a poster and on collectors’-item 2018 tee shirts during Saturday’s Bird Fair 8:30 a.m. until 4 p.m., also at Sheraton Kona. 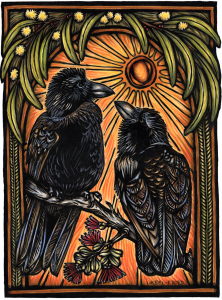 The block print by Loebel-Fried, depicts the last known wild Hawaiian crows, the Kalahiki Pair. Inspired by a Jack Jeffrey photograph, the rising sun background celebrates the recent release of captive-bred birds into the rainforest of Maunaloa and shines hope for the alala’s continued survival. 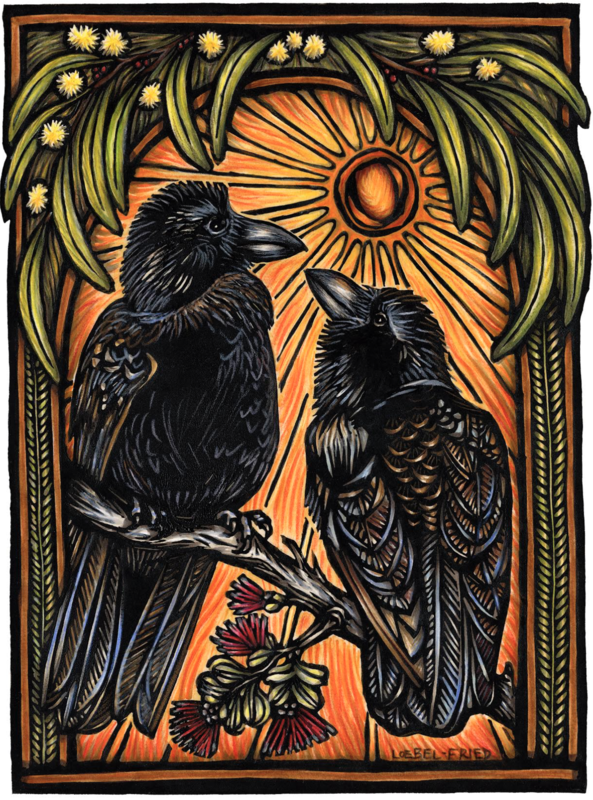 According to a recent Washington Post article, of the six species of crows native to Hawai‘i, only the ‘alalā is left. Other auction donations include binoculars valued at hundreds of dollars, hotel packages and activities. The all-day Saturday Bird Fair agenda is action packed focusing on the successful breeding and release program for alala at the Keauhou Bird Conservation Center. Panel discussions throughout the day include individuals who are among the who’s-who in ornithology; Jeff Gordon, president of the American Birding Association; Michelle Reynolds, Ph.D., USGS; Drew Weber, Cornell Lab of Ornithology; Jackie Gaudiso-Levita, M.S. ; Alison Greggor, Ph.D.; Donna Ball, Ph.D.; Tim Appleton, Founder of the British Bird Fair; Steve Hess, USGS Biologist; Cali Crampton and Noah Gomes. Children ages 15 and under are free when accompanied by an adult. Adult entry is only $10 and includes $5 in Birdie Bucks that can be spent on items at vendor booths and in the silent auction. Local food trucks will be nearby along with arts, interactive crafts and gear booths. The festival concludes on Monday, Sept. 17, with the opportunity to protect and restore bird habitats with specific projects. 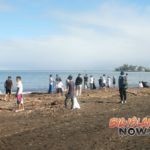 Volunteers will assist at the Maunakea Forest Restoration Project, or at Hawaii Wildlife Center during their Community Project Service Day. Detailed schedule of events and reservations available online. 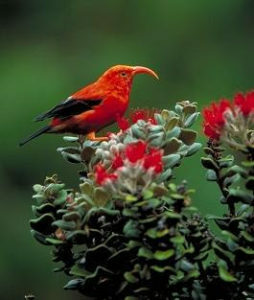 Beneficiaries of the four-day event include the Hawai‘i Wildlife Center and The Hawai‘i Island Coast to Coast Birding Trail administered by the Department of Land and Natural Resources Division of Department of Forestry and Wildlife. 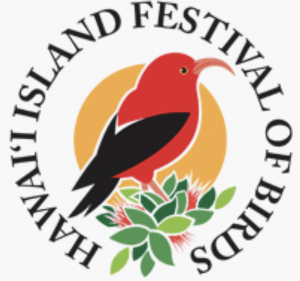 Sponsors of the Hawaii Island Festival of Birds include Hawai‘i Tourism Authority, County of Hawai‘i, Hawai‘i Forest & Trail, Destination Marketing, Hawai‘i Wildlife Center and Alaska Airlines.